Hi-5 World today opened its very first pre-school and learning center called Hi-5 House of Learning (“Hi-5 HOL”) here in Kuala Lumpur. Through play and discovery learning, children aged between 18 months and 9 years old will be able to enjoy the Hi-5 experience in preschool classrooms and build the foundational skills for school readiness the Hi5 way. The opening also saw Hi5 music group, the popular quintet on the famous children series, leaving their handprints behind as a token for the school. Parents looking to expose their children to learning will be pleasantly delighted to experience the comprehensive pre-school curriculum system developed by Australian early childhood education specialists Dr. Catherine Martin, Helen Martin and Julie Greene. Hi-5 HOL’s curriculum offers a multi-faceted approach to learning based on influential theories including Gardner’s and Piaget’s theories of child development. Through movement, music and creativity, Hi-5 HOL presents a rich, playful and fun learning environment augmented by video clips, songs, and stories from the award winning children’s program! “This curriculum has been developed with the collaboration of early childhood specialists Helen Martin and Dr Catherine Martin and we are ever so eager to share it with the children of Malaysia who we know are avid fans of Hi-5 House. 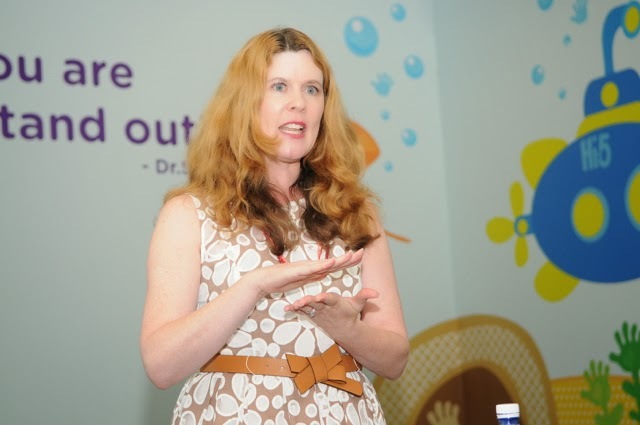 By merging the Hi-5 brand with an educational platform, it is our hope that we will be able to encourage learning and school readiness in a fun Hi-5 way!” said Julie Greene, the Executive Creative Director of Hi-5 World in a media briefing. What sets Hi-5 HOL apart from other preschools is its unique learning model. Each week, children will be greeted by a video message, specially recorded for the children, from the Hi-5 House cast. And throughout the week, children will explore five segments in Hi-5 House series with a central topic each day. For example, Monday is Shapes and Space day that focuses on Visual Learning. Tuesday is Wordplay day that focuses on learning English language and literacy. Wednesday is Puzzles and Patterns day that explores Logical and Mathematical concepts. Thursday is Making Music day and explores musical concepts. Finally Friday is for Sharing Stories where children learn about Literacy and develop Social and Emotional Awareness. “Hi-5 HOL is a fun-filled platform for young children to enjoy and discover all aspects of learning. On screen, Hi-5 projects a buoyant environment that we believe children will learn best. Now, we want to replicate that environment and present it live in the classroom. In Hi-5 HOL, children get to live the Hi-5 House experience in their everyday journey discovering the world and themselves,” said Datuk Jared Lim, the Chairman of Hi-5 World when addressing the media. Hi-5 HOL will offer age-targeted programs including Pre Nursery, Nursery, and a series of enrichment activities for children with different inclinations and interests. Hi-5 HOL is located in a spacious 10,000 square feet school compound in Damansara Heights featuring a variety of facilities such as an outdoor obstacle course playground, indoor playground, and heated salt chlorinated swimming pool, rock climbing wall, gymnastic room, music room, book room, kitchen for cooking classes, and a cafe. Visit http://school.hi-5world.com for more exciting details and register to maximize your young ones’s potential.